The Venerable' Bede (c.672-735) finished writing his 'Ecclesiastical History of the English People' in 731; it is an historical account of Christianity in England down to his own lifetime. It has been called 'the foundation of all our knowledge of British history and a masterpiece eulogised by the scholars of every age'. 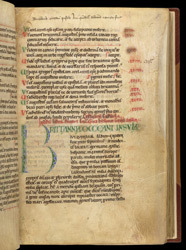 In this manuscript the text is followed by a series of annals which show that it was owned by Plympton Priory, in Devon. This page contains the end of a list of the chapters of the first book, and the start of Book I itself.